Bay Area Marxist group's analysis of the anti-police brutality movement that emerged after the killing of Oscar Grant. In this essay, they are severely critical of the role of the non-profit organizations and the Revolutionary Communist Party. This was released in July 2009. The murder of Oscar Grant set Oakland on fire, but who put the fire out? The working class people of Oakland, their consciousness set ablaze, found an inadequate set of organizational tools at their disposal to do the work that deep down we all know has to be done – confront the state (government) and its underlying property relations. structure through which to effectively challenge their oppressors. of the left today. We believe new leadership is necessary, and hope that this document can contribute to its emergence. What is important to note is the role of the state. The Force Act of 1870 and the Civil Rights Act of 1871 were also called the Ku Klux Klan Acts due to the fact that Federal law gave legal justification and protection for racist violence to exist and reproduce itself. In 1948 the last legal lynching took place.3 Indiana Senetor Albert Beveridge, in 1900, openly said, “We are the ruling race of the world….we will not renounce our part in the mission of our race, trustee, under God of the civilization of the world. He has marked us as his chosen people…He has made us adept in government that we may administer government among savage and senile people.”4 Police then started engaging in systematic “justifiable homicide” in the new urban Black communities that formed after WWII. The murder of Oscar Grant is the most recent episode of this long oppressive history. The Coalition Against Police Execution (CAPE) was formed in response to the January 7th rebellion to provide leadership for the emerging movement for justice for Oscar Grant. It was composed mainly of nonprofit activists. They immediately called for a protest the following Wednesday, January 14th. At the planning meeting one of the leaders emphasized that the coming protest should have “a grandmother spirit where you go to the store and you come right back with the correct change.” The ‘grandmother spirit’ meant that the protest should not go off CAPE’s script and result in more rebellion. The day before this protest Mehserle was arrested, due to the rebellion the week before, and the possibility of more uprisings. Both CAPE and the system wanted to ensure that the January 14th protest wouldn’t get out of hand. At this time, many moderates said that the struggle had been partially won, while others argued for “systemic change” in the form of mandatory police sensitivity training. Others could be heard advocating armed resistance to the police. After the last speaker, people marched back to the downtown city center where the organizers repeated their instructions to the crowd: the protest is over; it’s time to go home. However, people’s thirst for justice was not quenched by the symbolic march. Militant Black youth amongst the crowd were eager to confront the heavy police presence rather than simply go home as directed by CAPE. As groups of people congregated in the intersection of 14th & Broadway the militant energy was clearly felt by all, perhaps most of all by CAPE who seemed to expect it. As soon as people squared up in front of a line of riot police, CAPE activists immediately intervened, linking arms and attempting to block the people from approaching the police. When CAPE activists, all wearing neon vests to distinguish themselves as figures of authority, lined up between the people and the police, they played the exact role that Roy examines above: they became a buffer between the people and state. They faced the people, backs turned to the pigs, and tried to put out the fire of people’s emerging consciousness and militancy. We must ask: were the actions by CAPE leadership purposely directed towards squashing the energy on the night of January 14th? Or were they confused moves on the part of well-intentioned activists, whose strategy wasn’t able to incorporate the rebellious mood on the streets? To answer these questions we must examine closely the role nonprofits play in relation to the system’s power structure. Through their “buffer” tactics and diversions from confrontational struggle, Bay Area nonprofits effectively acted as an extension of the state. Nonprofit funding from foundations suffocates the development of a real revolutionary formation, keeping the politics of the nonprofit organization safely within the bounds of the rules of the system. In order to go further we must understand that the state is a set of tools that the ruling class controls, including courts, elected officials, and most importantly, a monopoly on the use of violence through the police, army, and prisons. A primary purpose of the state is to keep the working class in check, forced to either slave away making profits for capitalists, or self-destruct when their labor is no longer needed. The state achieves these ends through two main strategies: coercion (brute force which protects the system) and consent (ideological persuasion which keeps the system running smoothly.) Hegemony is achieved by the state, and the ruling class on whose behalf the state operates, through the combination of coercion and consent. As a key part of this strategy the state exercises hegemonic power where, by consent, non-state organizations actually take on the tasks of the state, as Roy argues above. CAPE demanded, in point three of their What CAPE Wants and What We Believe, that “a citizen review board to monitor excessive force, [and] supervise implementation of diversity training” should be a solution to police brutality. This liberalism is not the sole fault of individuals within CAPE, but rather the result of the historical evolution (or degeneration) of oppositional politics in the Bay Area, which must be understood in relation to the state. The power of the state exists in places well beyond the police and the mayor; its ideological influence extends into institutions, such as churches, schools, trade-unions, and nonprofit organizations. Nonprofits may temporarily act against certain persons and decisions of the state, or even denounce certain laws. However, as a whole their political practices are colonized by the logic of the system, both through their material funding and their ideological visions. The Black Panther Party’s political work in the 1960s focused on organizing to take control of black communities through “socialistic” service programs and direct confrontations against police brutality. But by the 1970s their political orientation shifted to getting elected into local government and running social service institutes that were partly funded by the local state. While “socialistic” community service programs started under the banner of “Survival Pending Revolution,” they soon became service based programs solely focused on survival, and became divorced from the revolutionary strategy they were once part of. This shift represented the displacement of the revolutionary fire the Panthers were born with by the acceptance of the duties and practices of the state. The Panthers degenerated into an organization whose revolutionary politics were completely subordinated to the practice of providing social services. This helped set the political trajectory of the Bay Area nonprofit left by making it acceptable to call social services resistance. As we’ve mentioned above, the state doesn’t rule simply by the direct force of the police or the army, but also rules through ideologies, which validate its existence as a political and social system. For instance, working class youth of color are criminalized by the repressive side of the state, mainly the police and the courts. These same youth are also dominated by a “get rich by any means” ideology which leads to individualistic behavior. The correct balance of the gun and the dollar hypnotizes people into submission and individualism that ultimately keeps the machinery of the system running smoothly. What Gramsci is attempting to point out here, speaking in abstract terms, is that the system inherently seeks to incorporate opposition to itself within its own framework and parameters so that it doesn’t get out of hand. If we think about “parliament more closely linked to civil society” we must also think about the logic and laws of parliament becoming practiced in everyday “civil society,” especially within political organizations, such as nonprofits that consider themselves “left.” The more people and organizations become disciplined in the rituals and methods of the state, the more people are powerless against the state. When police kill innocent Black and Latino working class youth one can easily see deep “lapses in the administration of justice.” Politically they, “make an especially disastrous impression on the public,” which is why the state will broker deals of power with groups such as CAPE who call for a, “citizen review board to monitor excessive force.” The state realizes that its brutal repression will be resisted and rebelled against by the people. For this reason it needs ways in which to neutralize the activity of the oppressed through political buffers and interpreters, such as nonprofit community organizations. Throughout the process of negotiation with the state, the nonprofits see themselves as doing “good work” on the part of the oppressed. They believe this work will shift the state towards the side of the people. The problem is the state can never reform itself to be neutral or to be an agent against racist brutality or capitalist exploitation. The state’s historical nature is to be the brains and muscle for the Anglo dominated ruling class and the reproduction of capital. Nicos Poulantzas argues, “Through its activities and effects, the State intervenes in all the relations of power in order to assign them a class pertinency and enmesh them in the web of class power.”10 Every instance of social interaction, such as going to the grocery story, attending school, or getting married, is wrapped up in the web of business based social relations. Even when community organizations, nonprofits, and individuals come together to organize against state oppression their organizational strategies and ideological perspectives are still wrapped up in the webs of class power. Despite frequent references to the radical legacy of Oakland, CAPE behaved as an extension of the state, “organizing” people to be peaceful, go home and not take militant action in the streets. Many progressive people in CAPE, who took part in the attempt to contain the righteous indignation and militancy of the people, would likely consider themselves revolutionaries. They see the political work of organizing resistance as building town hall meetings with religious forces, caravans to Sacramento demanding that politicians “pay close attention to the issue,” healing circles for Oakland youth, and press conferences. While all these are useful and helpful components of a holistic movement, they are very low level responses to injustice, and the state has the capability to absorb these actions as simply bumps on the road. It is useful to juxtapose this grouping of activists and their strategies against other serious organizers, such as Black Panther militants, Palestinian militants, IWW militants of the 1910s, and Chicana militants of the 1970s, all of whom politically organized against the state to directly challenge its power through militant coordinated resistance. Such militant coordinated struggles included engaging in “illegal” strikes, mass school walkouts, mass un-permitted marches, and organizing the community against the police. Differences in tactics often represent actual differences in strategy, and strategy is guided by politics and ideology. Nonprofit activism has a “pressure politics” strategy, working under the assumption that US political and economic structures are capable of meeting the needs of working class and communities of color through lobbying and advocacy. As long as the state exists it is necessary for progressive movements to make demands from it on behalf of the people. But the question is how do we make those demands; through what method of struggle? The methodology of pressure politics narrows struggle into the parameters of the existing state-based governmental decision making process. Simply put: they don’t address the systematic nature of oppression. They fall into the illusion that politicians are neutral and can be pressured to “do the right thing”. CAPE activists argued that their actions on the night of the January 14th protest were an effort to keep the movement organized and not let it degenerate into chaos like what many people saw the January 7th downtown riots turn into. We recognize that the movement does need organization, and it does need leadership, but leadership and organization with a different strategy than that of CAPE. Despite the efforts to conjure up the “grandmother spirit,” January 14th ended up looking much the same as the previous week. The rebellious activity of January 7th and January 14th represent neither revolutionary uprisings nor meaningless destruction, but disorganized uprisings of the people against the state. The fact that it couldn’t move beyond press conferences and town halls on the one hand, and broken windows and flames on the other, only highlights the lack of organized militant leaders. Lost was the opportunity to channel such raw energy into mass un-permitted protests against the state, political strikes at workplaces, and city-wide synchronized school shutdowns. The problem was not too much militancy from the street, but rather a lack of trained militants with a clear analysis and a constructive plan that the mood on the street could relate to and follow. The main “revolutionary” organized force that attempted to lead a more militant movement was the Bay Area Revolution Club/The Revolutionary Communist Party (RCP). On January 16th, they called for Bay Area high school walkouts between 1pm to 3pm as a response to the Oscar Grant killing, and as a radical alternative to the moderate CAPE movement. The day of the walkout students from Berkeley High School, Oakland School of the Arts, Oakland High School and Oasis High School attended. They met in front of the Alameda County Court and held a speak out. Altogether, the crowd did not get beyond 50 people, with older RCP members maintaining a heavy presence. Chanting “the whole system is guilty,” the walkout transitioned into an un-permitted march through downtown Oakland. Along the way they tried to get other schools to walk out, but had no success. The crowd marched towards Oakland High holding up traffic throughout the way; at this point the Oakland Police Department moved in to attack. While high school students were beaten up, arrested, and sexually assaulted, RCP militants remained at a safe distance on the sidewalk. No RCPers were arrested. Of course, any instance of police brutality is outrageous – especially when the attack is directed at politicized youth, who are organizing against the police. The RCP’s analysis implies that the police attacked the youth for courageously taking the moral high ground against the system, while absolutely washing their hands of any responsibility for their own flawed leadership. This ‘leadership’ contributed to the students isolation and vulnerability to police attack, while the “vanguard” itself stepped to the side and played the role of spectators. The RCP is often accused of using young people as pawns in an elitist leadership’s pre-determined scheme, both as front line fodder and as tokens. This accusation usually demonstrates an anti-communist sentiment, which is problematic and anti-radical. However, episodes like this don’t offer evidence against this reading of RCP organizing. The RCP considers itself the vanguard (leader) of oppressed people, and they have a theoretical justification and understanding of their self-proclaimed position as the vanguard. This same theory simultaneously contributes to the clumsiness exhibited during their unsuccessful walkout. Despite Avakian’s clumsy, un-edited writing, it becomes clear that they believe their political lines (found in their newspaper) represent the aspirations of the oppressed and exploited – specifically, the working class youth of color they led on their disastrous walkout. Though political lines and perspectives are incredibly important, the RCP gets it wrong with its overemphasis on them. The RCP’s ideology fetishizes the role that “political lines,” or political views on different questions, play in history. Their flawed view of the importance of ideology leads them to believe that the political lines produced by their main leader, Bob Avakian, automatically generate revolutionary advancements in struggles. The RCP understands the organizing and mobilizing of oppressed youth as a mechanical process: first, they study and understand the writings of Avakian (which are supposed to be the “correct” political line) and then they go out amongst the oppressed and spread the good word of Avakian’s thoughts. The ideological perspective and political lines of Avakian are supposed to be adopted by the people and then spread around to others, primarily through the sale of the RCP‘s newspaper. The result is a tautological (circular) form of revolutionary organizing with an ultimate goal of expanding their readership. This flawed understanding of the importance of Avakian’s ideology contributes to a truncation of revolutionary organizing which leaves out consistent work amongst the oppressed. Organizing struggles amongst students against cuts to education, workers for better working conditions, or tenants against slumlords is labeled as “economistic” (aka, not political enough). The result is that nonprofits wind up asserting leadership over these struggles, and narrowing them into reformist directions which do not challenge the state. These nonprofit leaders and organizations become more closely linked with the oppressed, while the RCP remains largely marginalized and known in oppressed communities mostly for their fly-by-night newspaper sales. By allowing nonprofits to take leadership of these “economistic” struggles, the RCP loses the opportunity to expand the consciousness of the people involved in these daily class struggles, as well as the opportunity to advance them in a revolutionary direction against the state. By refusing to engage in the day to day struggles working class people face they lose the opportunity to develop meaningful relationships amongst the people. This lack of political roots amongst working class communities leads the isolated, self-proclaimed vanguard to overestimate its ability to call for “massive resistance,” such as the high school walkout they dreamed of happening on January 16th. The RCP would likely respond that the value of political roots in the working class lies solely on the correctness of the political line leading the way, which is the crucial starting point for meaningful action. Accepting this argument at face value, one would have to question the “correctness” of their line, and its pedagogical transmission, when it has failed so miserably to get through to the minds of the working class people of the Bay Area. The RCP is stuck between their stubborn dissemination of a “correct line” that never connects any real dots, and an adventuristic concept of action that is limited to protest activity. Intelligent, frustrated, sensitive youth get caught between a rock and a hard place. The leaders of the RCP’s failed January 16th protest expected to ignite the masses with a big bold move, but they failed. To put it in theoretical terms, they overvalued their own subjective factors (the “correctness” of their political line and small march) and underestimated objective factors (the fact that they had no significant roots amongst the oppressed, and therefore a limited basis from which to call for “massive resistance”). We are criticizing them, because in exalting themselves as representatives of communism and revolution they discredit these worthy goals. They sow distrust amongst the “masses” for all so-called outside agitators. We should redefine political line as the relation of revolutionary theory to militant organizing that actually advances struggles. On June 18, 2009, BART police officer Mehserle was arraigned for murder. A police officer has not faced murder charges in California for nearly 15 years, which made some activists and organizations shout victory. It is a victory but a small one. The legal system did not charge Mehserle with murder out of a moral obligation; it did it as a response to the militant protests and rebellions that took place on January 7th and 14th. Now that Mehserle has murder charges against him the question remains: will he be convicted? The disorganized rebellion that broke out in LA in ‘92 happened after the four pigs who beat Rodney King were acquitted. If Mehserle is acquitted there will likely be more disorganized rebellions in Oakland, but we need more than that to put an end to this oppression. - Tupac Shakur, beaten by Oakland Police in 1992 in downtown Oakland. Some activists in CAPE and most of the RCP would agree that we need a revolution to end oppression and exploitation. If we are serious about making a revolution then we need to be serious about taking criticisms and criticizing ourselves. So far we’ve been critiquing CAPE and the RCP openly and without holding back. Some might say that we don’t have a basis to criticize them since we didn’t provide alternatives at the time; but this logic misses the point. We will continue to have opportunities to connect revolutionary perspectives to spontaneous uprisings by the people, but if we don’t understand and learn from the mistakes of current organizations, then we will be doomed to repeat them and the system will keep on winning. Criticism of existing organizations is a necessary step in the direction of building the type of organization that can respond to movements of the oppressed and help guide them in a revolutionary direction, instead of fumbling or capitulating to the system. What was not known by any section of the Bay Area left is that a couple of days before the January 16th walkout, thirty Oakland high school students from three different schools met at Fruitvale BART, and discussed organizing a city-wide walkout of all schools in Oakland demanding justice for Oscar Grant. The walkout was to be organized autonomously by the students, rather than by nonprofits or revolutionary vanguards. It was scheduled for the following week. However, the fresh initiative that could have been the beginning of a lasting movement coming directly from the working class youth of Oakland would not have a chance to bloom. Some of the key student leaders of this meeting spent that coming weekend in jail; they were arrested at the RCPs fiasco “walkout” protest on January 16th. Robbed of its organic leadership the city-wide walkout was canceled. Meanwhile, the RCP organized another protest a few weeks later, which drew a few hundred people and marched peacefully to the police station before ending with the vague message that people should “go back and organize their communities.” Other groups such as By Any Means Necessary (BAMN), UHURU, and No Justice No Bart tried to have militant protests, but each one did not bring out a critical mass; even though No Justice No Bart shut down a couple of BART stations momentarily on a few different occasions. All of us missed the window of opportunity to provide leadership to the movement. The RCP and CAPE had their timing correct, but not their political lines. If Oakland’s flash of rebellion against the murder of Oscar Grant demonstrates anything, it is that neither the nonprofit sector, nor self-proclaimed “revolutionaries” have roots amongst the oppressed. Both can and will be overrun and shoved aside by the spontaneous militancy of the people. No amount of “Please go home!” and conjuring of the “Grandmother spirit” by the nonprofits stopped a militant section of Oakland youth from confronting the state through random destruction of property. No amount of “the whole damn system is guilty” and RCP newspapers turned these same youth into revolutionary cadre either. The challenge is to develop an organization that can match its strategy and tactics to the mood of the masses and infuse the spontaneous movements that develop from that mood with a more conscious and political view of their world. In defense of the RCP, they tried to figure out how to get revolution into the popular discourse, and attempted to mobilize people in a confrontational way against the state rather than passively serve it. It is also crucial to point out that no other radical organizations that claim to represent the oppressed and exploited working class people of Oakland or the Bay Area have any significant political base in these communities either. There are no obvious self-labeled revolutionary organizations in the Bay Area that surpass the RCP in terms of numbers, visibility, or consistency. But this observation only reinforces the fact that the radical left is in ruins 35 years after the demise of the Panthers. Many Black young adults at the January 7th CAPE protest talked about their parents being Panthers, and the need to directly take on the system. But how? First of all, Oscar Grant was a butcher and a UFCW union member. Why didn’t supermarket workers have a one-day strike protesting the killing? What about BART workers and city employees; why didn’t they have a one-day strike against the oppressive state? Sounds far-fetched to expect strike action in response to state violence? Maybe here in the US, but not in Greece. There, the police murder of a 15-year-old Alexandros Grigoropoulos triggered reactions which, very quickly, evolved from protests to riots to a general strike in which 2.5 million workers were on strike in December 2008. Within days the killer cop and police accomplices were arrested, but even this concession didn’t trick the movement into subsiding. The police murder set off the uprising, but the participants connected the murder with the issues of unemployment, neo-liberal economic measures, political corruption, and a failing educational system. Aren’t we facing similar problems in Oakland and in the US? Why can’t we imagine a similar response from our people? Much of the answer to this question lies in the fact that we lack organizations that apply revolutionary politics in such a way that builds deep organizational roots. As a political perspective, people have to know who their real enemy is and who their real friends are. Who is working into the popular consciousness proper targets such as big capitalists and the state, not small shopkeepers and automobiles? Who is organizing collective mass actions rather than acts of healing and social accountability. The Black Panther Party are another example. They mobilized thousands of people, in disciplined formations, chanting “off the pigs” and “its time for revolution” in front of the District Attorney office in downtown Oakland. Black neighborhoods in Oakland were self organized against the police. The Party, with political roots in the ghetto, was capable of mobilizing serious militant protests against the city and state against racist brutality. Less known is the Black Panther presence in the workplace. In 1970, the Black Panther caucus of the NUMMI auto-parts plant in Fremont, led a wildcat strike against a contract agreement the United Auto Workers Local 2244 had made with the company. The Panthers had roots in the community and in workplaces, which represents a serious model of political organizing that we need to adopt and advance now. During the explosive month of January 2009, it would have been possible to organize a major unpermitted protest of many thousands of Oakland residents to march through working class neighborhoods to demonstrate that the people are against the abuses of state. This could have been done in a way that invited people out to join the demonstration, and called for more lasting organization and working class collective action. One can imagine how the response to the Oscar Grant murder might have become the seed for a new militant organization in Oakland. People were angry and they were ready to take action. A city wide walkout, one day strikes, and a mass unpermitted snake march were all possible. Why didn’t anything more militant take place in January 2009? The possibility was there, but what was missing? . . . There was no organization. There was and is no group that parallels the Panthers today. The Bay Area left is incredibly weak, divided, and nonprofitized. Activists go from protest to protest, from event to event, with far too little strategizing about how to advance struggles beyond building quantitatively bigger symbolic protests and events. No organization has roots in the Oakland working class nor has militants implanted amongst working class youth of color. No group has developed militants capable of leading strikes and city-wide actions. Huey P Newton would have looked at the young rioters as potential Panther recruits. As we’ve said, riots are disorganized insurrections. The Bay Area left has proven that they are incapable of leading successful struggles. Where have we seen a successful struggle in the last 5 years in the Bay Area? Huey visited all the different left groups and found all of them narrow, weak, overly theoretical, and knew that something new, fresh, and militant, needed to be created. and bowing to spontaneity. We need to confront the day-to-day substance of capitalist exploitation wherever it occurs, and do this with the people who are actually experiencing the exploitation first hand. True revolutionaries provide tools to this end through educating and exposing the exploited to the lessons of history, expanding the parameters of the possible (thinking outside the capitalist box), and presenting strategies and perspectives on how to struggle. This should all be done in a manner that makes working class people not only actors but ones who produce and reproduce the training process amongst their peers. Let us not forget the lost opportunity Oakland had for the hot month of January 2009. 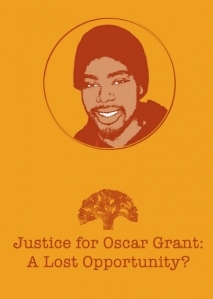 Thanks to the militant direct response by the working class youth of Oakland, Oscar Grant will always be honored as an unwitting martyr in our struggle for freedom. We know that his life was laid down in fertile soil, but we know that there are too few seeds being planted in that soil and too little water to nourish what seeds already exist. In the years ahead of us we can sense a re-birth of radicalism coming out of an intensifying crisis. It is time to shed old dogmas, careerist approaches to organizing, and collaboration with the government. Its time to turn back to the people, to the working class, and to be what Obama is clearly not – true socialists, true radicals, truly anti-racist, militant community organizers. What better place is there for taking up such a task than the city that gave birth to the Panthers and had the last general strike in US history? We will see new opportunities arise and we should be organizationally prepared to link our revolutionary visions with the people’s spontaneous energy. The exploitation which slaves revolted against still exists today. We are born into a world dominated by the accumulation of wealth for the few, with the accumulation of stress, exploitation and oppression for the many. Despite this, as we’ve seen in Oakland, we have the power to rebel against this oppression. As Blake states the “dungeon doors are open.” The time is ripe for a new revolutionary movement to be born and break through the walls of oppression and exploitation. We don’t have all the answers, but through collective dialog and struggle we can find them. There are more than enough reasons to make a revolution, and the challenge is to discover how to strike back against the system so powerfully that all the chains that bind us are broken. 3. Author Mike Davis in film Bastards of the Party. 6. George Ciccariello-Maher. COUNTERPUNCH. Arrest and Containment Fail Blunt Anger in the Street “Oakland is Closed!” January 16, 2009. 12. “Rebels of Oakland High.” Revolution Online. January 19, 2009. 13. P.348. Linebaugh, Peter and Marcus Rediker. The Many-Headed Hydra. 2000. Lose your union contract - and the health insurance and pension coverage for the members provided for under it - just for one illegal strike?